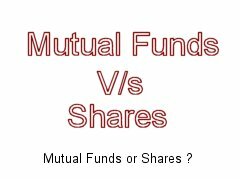 Mutual Funds or Shares ? Home » Mutual Funds » Mutual Funds or Shares ? A mutual fund is a professionally managed investment that offers diversity, liquidity and convenience. Each mutual fund is made up of individual stocks, bonds, or money market securities. Mutual fund company is registered company with SEBI (securities exchange board of India).There are various mutual fund companies in the market and few are mentioned below Reliance, HDFC, SBI, HSBC, Birla and many more. The mutual fund companies collect money from customers and invest on their behalf in various financial products.Investors who don’t want to expose to share market directly or who doesn’t have much knowledge of share market they prefer to invest in equity related mutual funds.Mutual funds consist of fund manager who manages all investments. Mutual Funds over the years have gained massively in their recognition. Apart from the many advantages that investing in mutual funds provide like diversification, professional management, the ease of investment process has proved to be a major enabling factor. Share is nothing but the Ownership of the company divided into small parts and each part is called as Share or Stock. It is also called by different names like equity, financial security. They become available if a company needs capital or money to operate as a business, it can generate the required funds by selling ownership in the company. A person carrying a share of a company holds that part of ownership in that company. A person holding maximum shares carry maximum ownership and designated like director,chairman etc. Mutual Fund is an investment trust that collects money from investors having a common financial goal. The income earned through these investments is shared with all the investors. It is considered as the most suitable investment for the common man as it offers both diversity and liquidity at a lower cost along with professional management. Share investment requires a good amount of knowledge, understanding and time. Not only that If you want to start investment with small amount mutual funds is best option. « Why you should start your Investment earlier?